On reflection, it sounds like a slightly dodgy euphemism. Yet this is the cry to be heard at the moment around Chez Chillikebab. 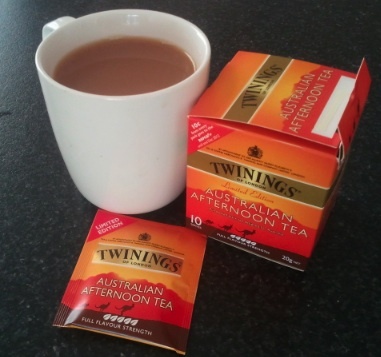 The reason, of course, has nothing to do with the Prime Ministerial shenanigans, but everything to do with the latest blend of tea launched by Twinings – Australian Afternoon Tea. We rather like it – rich and robust, and a perfect match with a biscuit in the afternoon. Apparently this is the blend of tea created by non other than Kevin himself – I picture him in a white coat, owlishly measuring out tea leaves whilst kettles steam around him, working to create the perfect Australian tea. I quite liked Kevin back in 07 when he was campaigning, but I have to say I did have my doubts when he declared that his biscuit of choice was the Iced Vovo. This really isn’t a great biscuit – rather prissy and fussy, and lacking in substance. Some would say this is also an apt description of the former (and perhaps soon-to-be again) Prime Minister. As far as I know, Julia Gillard hasn’t declared what her favourite biscuit is. However, I imagine something more workmanlike. I’m tempted to suggest the Ginger Nut, as I think it’s hard, unyielding and slightly spicy aspects might be appropriate, but I’m worried about being accused of simply making a cheap ginger gag. So perhaps the Orange Slice is a better suggestion – actually much better than its reputation would suggest, but forever struggling in the popularity stakes. I think I’d better leave the murky waters of political satire before I get in above my head. However, I do recommend a cup of Kevin Rudd to everyone, whatever your political persuasion. Last week, Toddler Chillikebab turned two years old, so we had a birthday party. it was huge amounts of fun; large numbers of sugared-up toddlers charging about, pushing each other over and then wailing, a ridiculously large cake with butter icing slowly going rancid in the twenty-eight degree heat, and a whole load of thoughtful presents that were mostly broken within the hour. I had an inkling in advance what it would be like, as all of Toddler’s little friends are turning to two too and we’ve been to a few such parties recently. The key to survival, it seems, is plenty of adult party drinks to dull the sound of the screaming little voices, and if necessary to be used as sedatives after the event (both for the adults and the children…). Yes, beer was going to be needed, along with bubbles to celebrate the auspicious occasion, and some wine for the shielas. 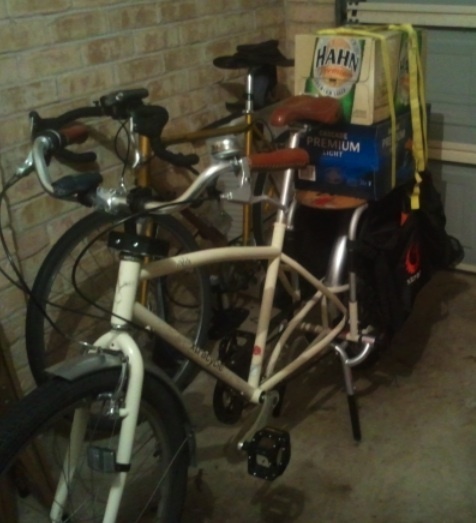 So earlier that day I set off to the local bottlo to pick up what we needed – two cases of beer, three bottles of bubbles, some wine, and two bags of ice. I loaded up my purchases on the counter, and the buy offered to give me a hand carrying them out. ‘Thanks,’ I said, ‘I’m just outside’. The look on his face when I dumped the beer cartons on the back of the Radish was priceless; a mixture of astonishment and disbelief. He put the other things down next to me, and wished me luck, shaking his head as he went back inside. The last time I changed the tyres on the fixie was, erm, well actually I’ve never changed the front tyre. It’s the one that came with the bike four years ago. The rim is nearly worn through, the hub bearings need replacing, but the tyre is still going strong after what must be at least 25,000 km. Well, that’s an exaggeration. Not the longevity of the tyre, but the notion that it is ‘going strong’. Actually it’s pretty knackered, with the kevlar belt showing through in some places and big cuts and holes in in. There’s also enough glass embedded in it to open a bottling plant. And there’s a lot of broken glass around Sydney at the moment. Lots of public holidays means lots of drunken louts throwing beer bottles into the street. From the amount on the bike paths, you could almost believe people break glass there deliberately. Surely no Sydneysider would be so inconsiderate? That’s the kind of behaviour you might expect from Melbournian cricket celebrities, but not the people of this fine city. 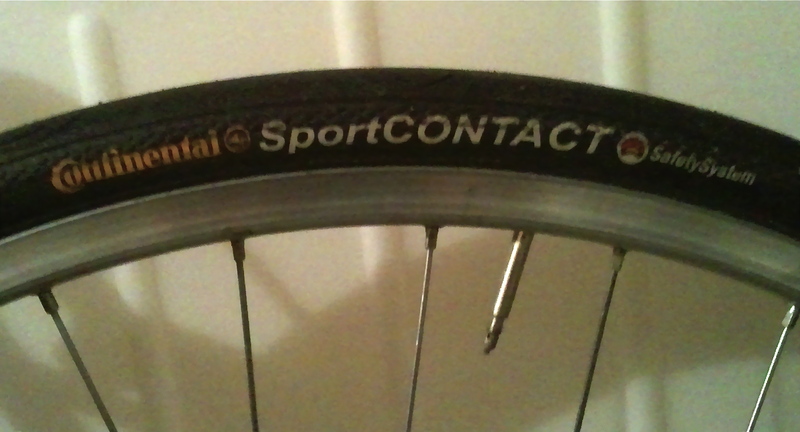 Anyway, perhaps inevitably, my tyres have succumbed to the glass. Both of them, in fact, in close succession. A flat on the front on Friday, and a flat on the back tonight. The one tonight was particularly painful, as I was on a three-line whip to get home early so Mrs Chillikebab could go out to her dance class. I wheeled the bike out of the rack at work, and realised I had a flat. I had ten minutes to spare, so set to to quickly change the tube for the spare, only to discover the spare (which I have never used, having bought it years ago and tucked it into my saddlebag) was useless – the valve just came off the tube when I attached the pump to it. This meant I was going to have to actually find and fix the hole in order to ride home. And the clock was ticking. I examine the tube looking for the hole. No, can’t see it – damn, precious minutes wasted there on a fruitless search, I’m going to need a bowl of water. Rush into the bathrooms, fill a basin and work my way around looking for the tell-tale stream of bubbles. I start at the valve and work around to the right, going over the whole tube only to find the hole just to the left of the valve. Quick, rough it up and get the rubber cement on it. Now wait for the cement to go tacky.Wait some more. WAIT! You know you have to wait. I tap my heels impatiently, and, able to stand it no longer, peel off the patch and stick it on. It slides around and the cement is runny under my finger. Too soon! Oh no, am I going to have to do the whole thing again? I will it to stick, holding it on as I rush back to the bike. Put a little air into it, back under the tyre, pop the tyre back on, and now just to pump it up. I had had a nagging doubt about this part of the operation from the beginning. The last time I used my mini-pump was the last time I got a flat, and it didn’t really work then. It worked even less well this time. As I pump, the air leaks away, so I pump harder – pumping like a dervish I manage to get just enough air in to get me off the rims. Jeez, I need a new mini-pump. I get home with seconds to spare. Mrs Chillikebab does a quick handover as she heads out the door (Baby fed at 5, had bath, looks tired. Toddler ate well, lively, seems to be getting the hang of the potty) and vanishes. I stand surveying the scene; the usual carnage of toys everywhere. Toddler wants a cuddle but I am hot, sweaty, and my hands are filthy with oil and brake dust. ‘Cuddle now!’, she wails, and then wees on the floor. Baby Chillikebab just smiles up at me from her mat, and then contentedly fills her nappy. enough to start it oozing out around the legs. I started back at work on the third of January – earlier than many people, who took off that week as well. What really struck me was how quiet the city streets were. There was virtually no traffic; when I went out an lunchtime the streets were deserted. There were still quite a few pedestrians, however. And of course, the traffic lights were still giving the majority of the green time to the non-existent motor traffic, with pedestrians (or at least those not prepared to jay walk) forced to wait for several minutes just so they could cross an empty street when the green man told them to. 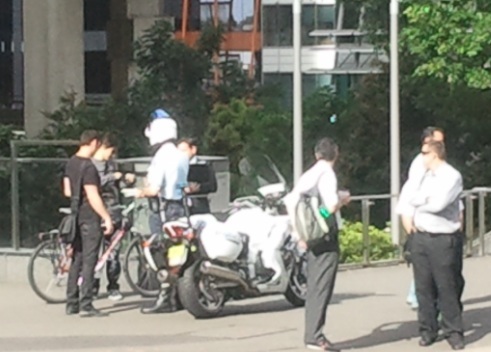 It really highlighted the problem we have in Sydney. The amount of traffic on those days is the amount of traffic we should have on any day. Congestion charging, punative taxes, road closures – do whatever it takes to get the city streets less busy. And then let people, rather than cars, have the streets. 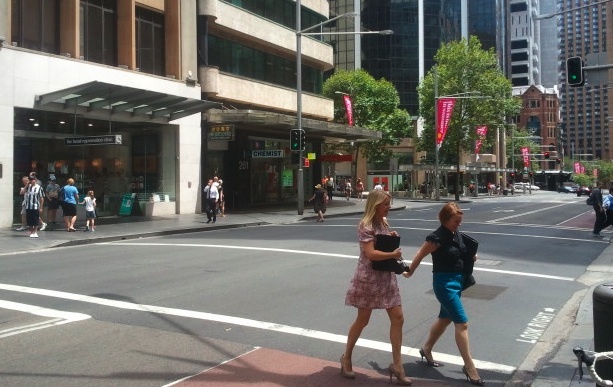 Let people be able to walk from one end of the CBD to the other without endless waits at traffic lights on every corner.